Used for order assembly, outbound shipping, and to return goods. 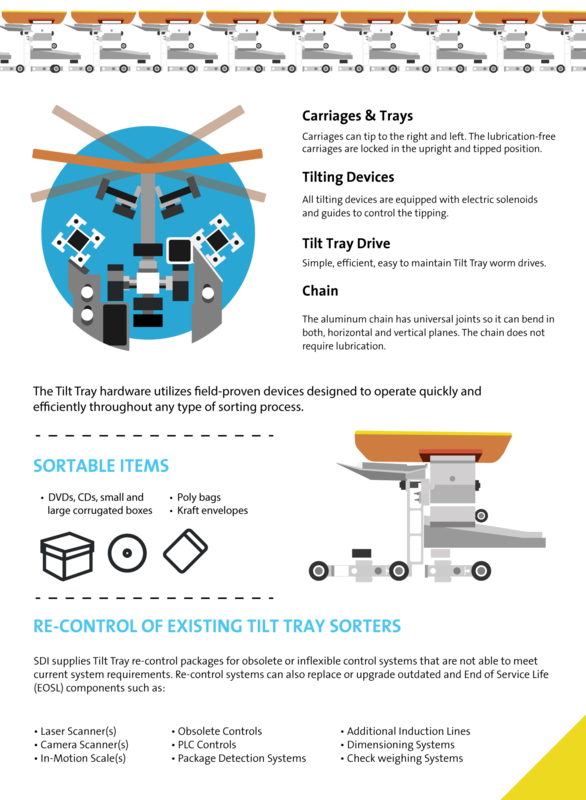 SDI’s tilt tray sortation systems are used by high volume shippers and can be designed as packing and/or shipping sorters. Either system can handle a broad range of package mix, are often employed where a large number of gates or destinations are needed and in applications with heavy volume requirements. Packages can be manually or automatically fed onto the trays and with multiple in-feed and induction areas can achieve the highest possible sortation capacities. In-motion scales can be incorporated into the automatic inducts to add check-weigh and parcel manifest capability. Tech Conveyor can design the right solution for your high speed sortation requirement.